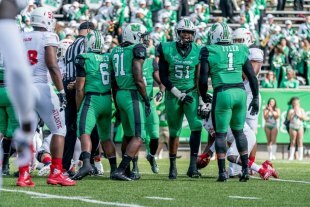 HUNTINGTON, W.Va. – There is a board outside of the Marshall football locker room with a photograph of every takeaway the defense has had this season. The pictures feature the player who created the turnover, accompanied by timestamp of when the play happened. At the top of the board are two words: Mission Takeaway. On Saturday afternoon here at Joan C. Edwards Stadium, with Lane Kiffin and the high-powered offense of the defending Conference USA champion FAU Owls in town, Marshall took away everything in a 31-7 win. The Thundering Herd defense took away the effectiveness of Kiffin's offense, took away standout running back Devin Singletary and literally took the ball away with five turnovers created. Adam Fuller's defense, on his 42nd birthday, took the cake and ate it, too. "I can't say enough about our guys' ability to prepare," said Fuller, who heaped praise on defensive assistants J.C. Price, Cornell Brown, Byron Thweatt and Mike Treier. "We've been really good in the first quarter all year. It's important to start fast against a team that always starts fast. They've been doing a great job all year as far as how they prepare and bringing that over to the first drive and the first quarter. It's just about sustaining it throughout the football game." Marshall (5-2, 3-1 Conference USA) did that throughout the game on defense. FAU (3-4, 1-2 C-USA) entered the game averaging 34.7 points, but the Herd limited the Owls to one inconsequential touchdown. In Kiffin's 77th game as a college football coach, the 7-point output equaled the lowest total of his career. Overall, the 24-point margin is the fourth-worst of Kiffin's career, which includes games at Tennessee, Southern Cal and FAU. On the field, Singletary could not crack the Marshall defense. He ran eight times for 17 yards in the first half and 16 times for 39 yards overall, his lowest single-game rushing total of the season. Singletary had a 19-game touchdown streak snapped, too, going up against a Herd run defense that ranks in the top 10 nationally. "FAU does so much to you," Fuller said. "They have really fast players who create space, so you're giving your guys as many keys as you can to make sure they're attuned to what could happen before the ball gets snapped because they go so fast. We changed how we signal it today. I became the main signaler so we could lose one more step in the process of how you call it. "They're such a good run team and we've been really good against the run, but to see our strength against their strength go up was huge." Marshall's defense set the tone early, forcing FAU to a three-and-out on its opening possession. In the first six games of the season, the Owls had averaged nine plays, 53 yards and a time of possession of 3:22 on game-opening drives, which included three touchdowns and a field goal. FAU quarterback Chris Robison began the game with an incomplete pass, Singletary rushed for three yards and backup running back Kerrith Whyte was stopped for no gain, leading to a punt. FAU had two punts and an interception in the first quarter, and Marshall did not allow a touchdown in the opening quarter for the 10th consecutive game. The Herd has allowed 9 points in the first quarter this season, an average of 1.3 points per first quarter. "Start fast, play 60 minutes as hard as you can and finish strong … those are the three things you're always trying to push," Fuller said. "It's so critical to come out of the gates. I like that stat because it's about preparation. It means your kids are confident going into the game about the plan and they're able to execute the plan. That's why I'm excited about playing good defense for playing defense in the first quarter. You don't get a win for playing well in the first quarter; you get a win for playing all four quarters." Marshall opened scoring with 14:23 left of the second quarter when Justin Rohrwasser made a 40-yard field goal to make it 3-0. The Herd won its 15th consecutive game when scoring first. FAU's only points came on the ensuing drive when Robison connected with tight end Harrison Bryant for a 2-yard touchdown to make it 7-3 with 10:52 left of the second quarter. Marshall regained the lead for good with 3:26 left of the second quarter when junior quarterback Alex Thomson found junior tight end Armani Levias for a 29-yard touchdown. The Herd held a 10-7 lead at the half. The lead ballooned to double digits, 17-7, when sophomore running back Tyler King scored from 17 yards out with 13:52 left of the second quarter. King finished with 125 yards on 21 carries, his third consecutive 100-yard game. That scoring drive took only three plays after senior defensive lineman Malik Thompson came down with an interception to give the Herd the ball at the FAU 27. Thompson's first career interception – at any level of his football career – was one of four by the Herd defense. Junior cornerback Chris Jackson, junior safety Malik Gant and senior linebacker Artis Johnson also had interceptions, and Thompson forced a fumble that was recovered by senior cornerback Kereon Merrell. The Marshall offense had zero turnovers, the first time in Doc Holliday's nine-year career his team has had five takeaway without an offensive turnover. Thomson and Levias connected again in the third quarter, from 13 yards out, to make it 24-7. Thomson added a 3-yard touchdown run with 1:35 left to arrive at the final score. Thomson finished with 102 passing yards and 50 rushing yards. Senior running back Keion Davis added 60 yards on the ground in his return from injury, including a 41-yard run on the final scoring drive. Levias led the team in receiving yards (47), and senior Tyre Brady added a team-high five receptions. But, in what Holliday called the best all-around team performance of the 2018 season, the defense was the story. FAU, in its second season under Kiffin, had scored 30 or more points in 14 of the last 16 games. Singletary entered the game as the nation's leader in rushing touchdowns and missed tackles forced. FAU averaged 4.54 yards per play on Saturday, and the only team to hold the Owls to a lower number was No. 9 Oklahoma in the season opener (4.38). The FAU offense converted only three of 17 third down opportunities and one of four fourth down tries. "The goal is two every game," Fuller said. "We like to emphasize it. Our job is to take the ball away whether it's stopping them on third down, fourth down or just physically taking the ball away on any down. It's exciting to be able to see that board filled up."